So what do we want to achieve with an EQ ? In mixing, what I want to do is cleaning up the sounds, generally creating space within an ensemble of sounds, making everything sit well in that mixture, making everything have its "place" in side frequency spectrum. That's why we use equalizers and it involves getting rid of resonances and over emphasis or emphasizing a particularly important part of a sound. This article is about the order that best be applied (shortly called first cut, then go on) when EQing and why it is reasonable to apply that order to your equalization steps. Single sound or a complete mix, when you are EQing you could cut an overemphasis of a specific part of the frequency range or a rumbling low end or a too sharp high end and this should be our very first steps before we go on further boosting or processing that sound. Cleaning up a signal, erasing for example a screaming 130hz resonance or an annoyingly loud 13khz resonance or anything that's overpresent below/beyond/ in between that range. There is a rule of thumb to EQing, which says: make your cuts surgical, with a thin shape, and most of the time it is wise to follow that rule. For example: you can erase a ringing part of a sound with a thin cut but you're not going to create that ringing part if you create a wide boost. Thin cuts and wider boosts sound more "natural" or less identifiable. Coming back to a clean sound, if you don't do that cleansing and next insert a compressor, the "dirt" - for lack of a better word - that's still in your audio material will very likely affect how your compressor behaves and how much it reduces the gain. You don't want a big spike in the frequency, that's not an essential part of the sound, let your compressor reduce the overall gain of your sound ! I will claim that you definitely don't want any further processing with that "dirt" attached to your signal. Make use of high pass and low pass filters, also utilize different bell shapes, different slopes for precision where it is necessary. I'm the last person to discourage anybody from questioning and testing principles but as a matter of principle, you will wash your dishes before you use them again, yeah ? You clean your car before you pick up your date, right ? There you go ! If you don't know what part to clean up, one way to find out about specific parts of the spectrum and how they sound is to sweep through the spectrum and seperate the audio of those particular parts. 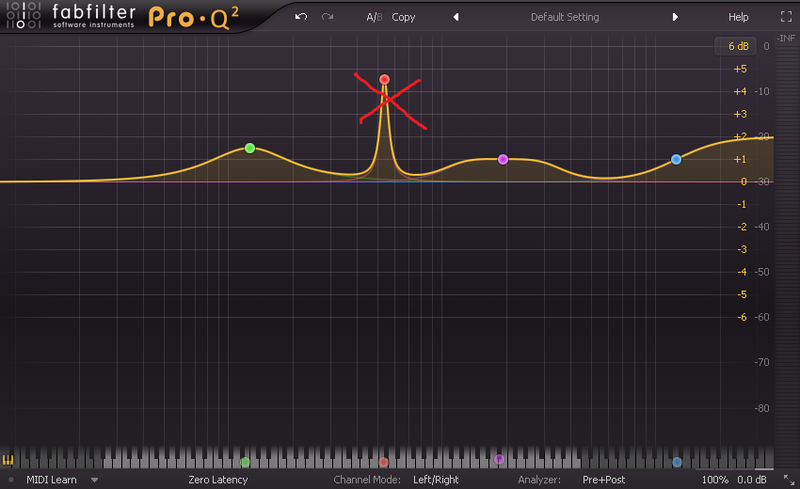 Many EQs have this "solo-listen-feature" and in this EQ the trick is to click on the headphones (red mark) and drag the cursor through the frequency range that you want to check out. Find out where problematic areas could be. But only use this a rough guideline for your changes, always check back and compare before / after. When you're done cleaning up your sound is when you're ready to go on with either applying musical EQing (bringing out the best of an instrument if necessary) or further processing. For example: A vocal could be sibilant but generally lacking some presence or a vocal could sound boxy but missing some overall low mids. So you go ahead with step one and clean up the sibilance or boxyness with a surgical approach to cutting frequencies out and then go on to boost with a much wider bell shape curve or shelf even to make up for what you think is missing. That way you have attenuated something critical and in the end empowered something fundamental or beneficial without giving it more of that critical part. Try to avoid a steep curve for a boost, it can add a "ringing" sound. Again, reason, logic and a little bit of critical thinking will help you with everything in the long run.